Please use the preselected setup! Unlike the standard setup, it tells you how to place the Holy Isles, and the players' starting Shrines and Novices. Getting started will be easier this way, as you will not need to bother where to place your starting pieces. Text referring to the changes in the preselected setup is marked green. When you play this game for the first time, the sheer amount of options may seem confusing. We suggest you play a few rounds to grasp what is going on - the interrelations will quickly become clear. 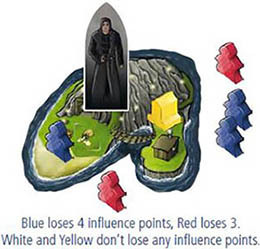 Each player receives 5 influence points, the components of his color and places the Overview sheet in front of him. Randomly choose a start player and give him the start player figure. Construct the Temple island by assembling the 4 frame pieces. Beginning at the Temple Gate, place a number of randomly selected Temple boards equal to the number of players face-up within the frame. Place the remaining Temple boards face- down in the vacant spaces. They remain face-down for the remainder of the game. Remove all Temple tiles from play that do not match one of the colors of the Temple boards in use. Randomly distribute the tiles 1-4 (if not removed) among the players. Then each player places the received tile together with his own Novice on the proper space in the Temple matching the number of the tile. Finally, place a "book of Wisdom" on each of these tiles. Place the remaining Temple tiles and the Guard tiles on the path around the Temple as follows: Firstly, place the lowest-numbered Guard tile (2) next to the Temple Gate. Then, starting with the highest-numbered Temple tile, place a number of descending Temple tiles equal to the number of players on the next free spaces of the path. Continue placing the next highest Guard tile and another set of descending Temple tiles until all Guard and Temple tiles are placed on the path around the Temple. Place the Guard of the Temple figure on the Guard tile of value "6". Pile up the 4 Time tokens (with the burning candle side up) and place them in the Meditation Room. Make sure the Time token with the "1" is on the bottom of the pile. Remove the Time token on top of the pile from play if playing with 2 players. Beginning with the start player, the players stack their Member of the Council piece on the first space of the Council of Priests. Put the influence point tokens on the board. Randomly place the 7 Holy isles tiles around the Temple Island. Preselected setup: Turn the Holy Isles on the numbered side and place them according to these numbers in clockwise order around the board. Place a number of matching Favor tokens equal to the number of players on each of the Holy Isles. 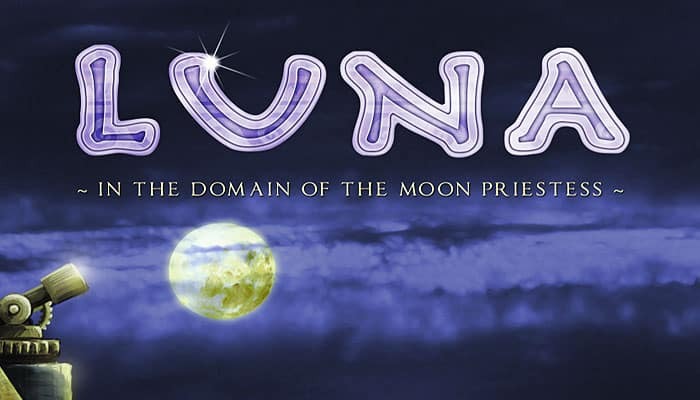 Take the proper moon Priestess figure according to the number of players: 2-3 players: take the Moon Priestess of value "5", 4 players: take the Moon Priestess of value "6"
Distribute the moon Priestess, the master builder and the apostate figures on the Holy Isles of your choice. You may place more than one figure on any one Isle. Preselected setup: Place these figures as depicted on the Isles. Preselected setup: Each player places 1 Shrine and 8 Novices as depicted on the sles. Each player receives a Favor token from the two Isles where he has no Shrine and Novice on. This Holy Isle is the first one to be placed in the preselected setup. Place there 2 Novices per color. Also, place the Moon Priestess figure on this Isle. Apostate: players may lose influence points at the end of a round. Master builder: enables players to build Shrines. Guard of the Temple: serves as a round counter; approves, i.e. frees batches of Temple tiles from round to round. Preliminary round: Each player places 1 Shrine and 4 sets of 2 Novices on the 7 Holy Isles and receives 2 Favor tokens. A. Action Phase: Players take turns taking an action until all Time tokens are turned. Scoring: Receive influence points at the Moon Priestess and for Novices in the Temple / Lose points on the Isle with the Apostate. Preparing the Next Round: Return the Novices to the Isles, prepare the Time tokens, and move the 4 figures. 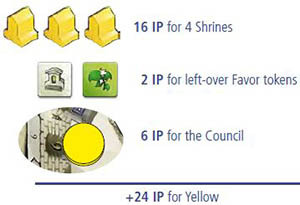 After 6 rounds, players receive additional influence for their Shrines, unused Favor tokens and their position in the Council of Priests. The player with the most influence points wins the game. There is no Preliminary Round if you use the preselected setup. Beginning with the start player and continuing clockwise, each player places one of his Shrines on a Holy Isle of his choice. Players must choose different Isles - no Isle may contain more than one Shrine at the beginning of the game. In the 2-player game, you may not choose the Herbal Isle. Next, beginning with the start player, players take turns to place 4 sets of 2 Novices on the Isles. No player may place another set on an Isle already containing his pieces (incl. the Shrine). The pieces of the other players do not matter for his placement. Finally, each player receives one Favor token each from the two Isles he has not placed any pieces. Beginning with the start player, players take turns to play a single action. An action may affect one or more Novices and/or consume a Favor token. All available actions are listed on the Overview sheets and explained in detail on the following two pages. Only active Novices may take actions. All the Novices on the Holy Isles are considered active. After taking an action that involves Novices, place the involved Novices next to the Holy Isle. They are now considered inactive. You may only take actions with your own Novices. Return any used Favor tokens to their matching Isles. At any time during the game, you may only have at most one token of each type. Use 2 Novices on one Holy Isle to gain the Favor token of that Isle. You may not gain a Favor token that you already own. Shrine bonus: If you own a Shrine on the Isle in question, you only need to use a single Novice. "Your Novices help the local Priest. As thanks, he owes you a favor". Use 2 Novices on one Holy Isle and place another one (if available) from your supply next to this Isle. All 3 Novices are inactive now. Return a Shrine Favor token and use 2 Novices on the Holy Isle with the master builder to build a Shrine there (if available). You may only have a single Shrine on each Isle, but there may be any number of Shrines from different players. Each one is worth 4 influence points at the end of the game. 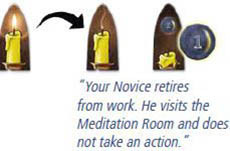 Actions "Priest's Favor" and "Promotion" only require a single Novice. It counts towards the number of active Novices during the Scoring of the Moon Priestess. Return an Herbal Favor token to reactivate 1 or 2 inactive Novices on one Holy Isle. Exception: You cannot use this on the Herbal Isle itself! Take any number of active Novices and place them next to any number of Holy Isles. 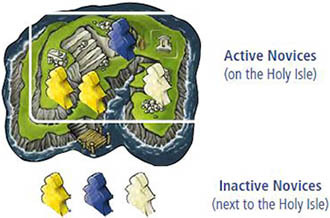 Return a Tidal Favor token and move any number of active/inactive Novices next to any number of Holy Isles. The moved Novices may come from any number of Holy Isles and/or the Landing stage of the Temple Island. Return a Sailboat Favor token and move 1 or 2 Novices from one Holy Isle or from the Landing stage of the Temple Island to another Holy Isle. These Novices remain active! You need 2 Novices from 1 Holy Isle to claim a free and approved Temple tile that has the same symbol as the Isle. "approved" means: The tile is lying between the Guard and the Landing stage. Put the first Novice on the Temple tile and deactivate a second Novice from the same Isle. Shrine bonus: If you own a Shrine on the Isle in question, you don't need the second Novice. bribery: Return a bribery Favor token to claim a tile which is lying between the Guard of the Temple and the next free Guard tile. Note: You cannot use a Novice Favor token to claim a Temple tile. Move an already claimed and approved Temple tile (see "Promotion") together with its Novice on the matching space in the Temple. Bribery: Return a bribery Favor token to move a claimed, but yet unapproved tile to the Temple, i.e. one that is lying between the Guard of the Temple and the next free Guard tile. Bribery or not: You gain a number of influence points equal to the printed-on number on the Guard tile the Guard stands on. The new Novice is adjacent to the opponent Novice. The opponent's Novice is not protected by a "book of Wisdom". Move any displaced Novices to the landing stage of the Temple. Players can pick their displaced Novices up by using a "Sailboat" or "Tide" Favor token You gain 1 influence point for each displaced Novice. Return a "book of Wisdom" Favor token to displace a "Book of Wisdom" in the Temple. Take a "Book of Wisdom" of your choice and place it under any one of your Novices in the Temple that does not have a Book. You gain 1 influence point by doing so. In addition, as long as the Book remains there, your Novice is protected from displacements. Use any number of Novices of any one Isle. Move your "Member of the Council" piece up a number of seats equal to the number of used Novices. Place your piece on top of any already existing pieces of other players unless this is the last seat in the Council. In this case, place your piece to the bottom of the stack. Use any number of Novices on the Holy Isle with the Apostate. Then move him a number of Isles in clockwise order equal to the number of used Novices. Return the Novice Favor token to replace an active Novice during an action. You may not replace the Novice that claims a Temple tile. You may not use it to (re-)gain the Novice Favor token. If you do not want to take an action, turn a Time token from top of the pile and put it on a second pile of turned Time tokens. Doing so does not finish the Action Phase for you! Once it is your turn again, you may still take another action. However, once the last Time token has been turned, the Action Phase is over. The player who turned this last token, gains 1 influence point. The player to his left receives the start player figure. He will be the start player in the next round. In the 2-player game, pass the start player figure to your opponent. Each player receives/loses influence points in 3 different ways: Players gain influence in the Temple and on the Isle with the Moon Priestess - they lose influence on the Isle with the Apostate. 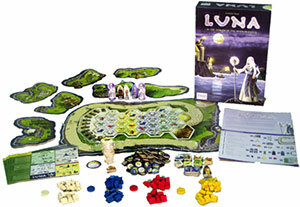 On the Isle with the Moon Priestess, count the active Novices and Shrines of each player. The player with the highest number gains a number of influence points equal to the large, printed number. The second and third places gain a number of influence points equal to the smaller numbers. Ties are resolved according to the relative position of the players in the Council of Priests. The player whose piece has moved the farthest breaks the tie. If there is more than one player on the same space, the player whose piece is on top breaks the tie. If there is no second or third place, no one receives the influence points of these places. "The Moon Priestess ministers a Service on the Isle that she has moved to and rewards its eagerest participants". On the Isle with the Apostate, count the active and inactive Novices of each player. Each player now loses a number of influence points equal to his count plus one. Players who do not have any Novices on or next to the Isle in question do not lose any influence. The Apostate does not affect Shrines. "The Apostate succeeds in leading the Novices into temptation". 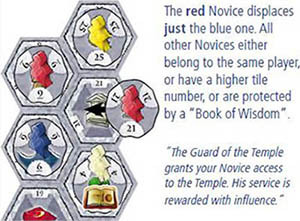 Each player gains 1 influence point for each of his Novices in the Temple. "Players get a reward for each round their Novices are serving in the Temple". Place all inactive Novices back on their Isles. They are now active again. The Moon Priestess and Master Builder figures move clockwise to another Isle. They move a number of Isles equal to the large, printed number. The Apostate moves clockwise to the next Isle that contains at least one Novice. The Guard of the Temple moves to the next Guard tile on the path around the Temple. Remove the Guard tile he just left from play. Once he reaches the last Guard tile, the last round begins. Restack the Time tokens in the same manner as during setup. The game ends at the end of the 6th round. Each Shrine is worth 4 influence points. Each unused Favor token is worth 1 influence point. 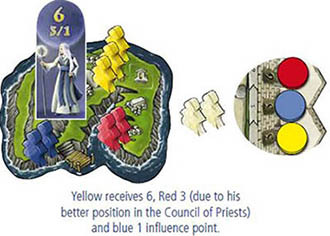 Players gain influence points according to their position in the Council of Priests. Finally, each player sums up his influence points. The player with the most influence points wins the game - his Order will provide the next Moon Priestess. Ties are resolved according to the position in the Council of Priests. Setup: only 3 Time tokens are needed. During the Preliminary Round, players may not place their Shrines on the Herbal Isle. At the end of each round, the current start player passes the start player figure to his opponent. The first player to use a Book token in a given round gains 2 influence points instead of 1.